In Cambodia, illegal logging is rampant and very, very profitable. So much so that The Phnom Penh Post cites one case last December where forestry officials, the military, and a conservation group were revealed to be complicit in large-scale illegal logging and corruption in the southwestern Central Cardamom Protected Forest. It’s estimated that the profits from that forest alone were in the tens of millions of dollars. Chut Wutty, a tireless environmental activist in Cambodia, was responsible for exposing that operation, among others. 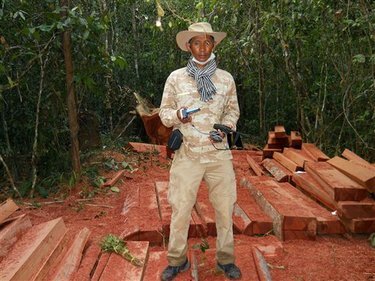 This past April, Wutty led two journalists to another “protected” forest that had been pillaged, this time in Koh Kong province. Confronted by military police, he was shot dead while trying to drive away. He is not alone in losing his life while trying to protect his country’s forests. Environmental activism means literally risking your life in some parts of the world, particularly in the Philippines and in some countries in South America, where powerful industries clash with locals who depend on the forests. Here in America, where we’re not likely to get killed for speaking out about environmental destruction, we should remember those who willingly take much greater risks.